Though it may seem that all mouthwashes are the same, they are not! 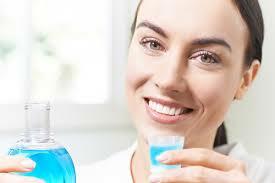 There are 2 major categories of mouthwashes-cosmetic and therapeutic. a cosmetic mouth rinse acts as a temporary breath freshner. It contains no agents that help protect teeth against cavities or prevent gingivitis. On the other hand, the therapeutic mouth rinses help prevent cavities and gum disease. If you are prone to cavities you need to choose a mouthwash that contains fluoride, this mineral helps protect your teeth by strengthening the enamel and making it more difficult for acids that cause cavities to affect the teeth. In persons suffering from gum disease, increased tartar build up allows gum disease causing bacteria to spread and inflame the gums. In such cases, mouth washes designed to control tartar and gum disease must be used. Unfortunately, certain fluoride containing mouth washes can contribute to gum disease as fluoride is another mineral that can nurture accumulation on tartar on your teeth as tartar is nothing but mineralized plaque. Thus most mouthwashes cannot address the 2 conditions simultaneously.